Just as with learning anything new, learning iOS development is challenging. It’s also fun, exciting and rewarding! So, can you take an approach that takes the frustration out of learning how to code, while getting you faster to the finish line? In this article we’re going to discuss how to learn iOS development. Instead of showing you step-by-step how to build an app, we’re going to look at how you can learn how to code. When you’ve finished reading this article, you will have a step-by-step plan for learning how to code. You know exactly what to do, what steps to take, and how to take them. Oh, and you don’t need any coding experience to get started. Let’s first talk about what skills you need to build your own apps. Use Xcode: Xcode is the Mac app you use to create apps. It has a code editor, project organizer, compiler, debugger, and many more important tools to build great apps. Swift Programming: Swift is the powerful programming language that you use to code iOS, macOS, tvOS and watchOS apps. It’s easier to learn than Objective-C, and Swift packs a ton of features that help you code productively. Build UIs: Every app needs a User Interface (UI). UIs are made up of buttons, views, navigation, labels, images, controls, etcetera. It’s important that you know how to build UIs and design them. Coding Logic: Your Swift code governs what happens in your app, and when. This is called logic, and it’s crucial to any app. Most of learning iOS development is focused on understanding code and logic, and being able to code from scratch. App Architecture: Writing clear, extensible and maintainable code is as important as writing code that works. App Architecture is a challenging topic, and it takes time to learn what solution works best in different scenarios. Can anyone learn how to code? Absolutely! You only need some time, and an app idea to get started. It helps if you don’t give up too easily, and if you know how to ask help from others. Xcode, the Mac app you use to create iOS apps, only runs on macOS. And to use macOS, you need a Mac computer. So, if you want to learn iOS development, you will need a Mac! There are other options too, as I’ve explained in this article. This is my no. 1 rule for learning anything. If you can set aside one hour a day to focus exclusively on learning iOS development, you’re guaranteed to make progress. It’s that simple. Research shows that our brains learn new information when we repeatedly expose ourselves to the learning material, in different ways. You could say that practice makes permanent, so by consistently spending time to learn iOS development you can master it. In the years that I’ve run LearnAppMaking.com, I’ve seen many people learn to code iOS apps. A pattern that stood out among successful learners is that they learned habitually, and kept their momentum between learning sessions. So, when you learn consistently, and get back to it regularly, you’ll learn iOS development more successfully. Learning is of course a complex topic. If you’re interested to learn more about how we learn, I recommend you check out Barbara Oakley’s excellent Coursera course, Learning How To Learn. Do excuses bog you down, when you want to learn iOS development? Commit to 1 hour of learning a day. Keep a run streak count on your calendar to keep yourself accountable. Mark every day you learned for 1 hour with a big red X, and don’t break your day-to-day streak. 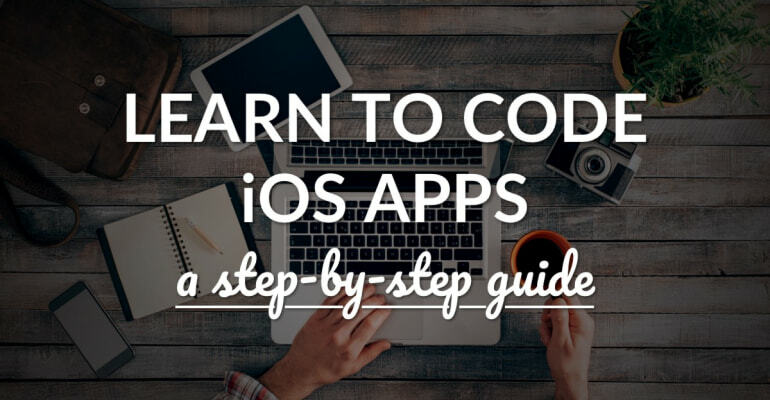 Let’s take a look at the topics you’ll need to learn to master iOS development. And get my open source Swift cheatsheet, while you’re at it! How do you keep up with Swift changes? I’ve learned plenty of new things in my life. Every time I learned a new skill, I would encounter something known as “the hump”. You want to get over this hump as soon as possible, because everything gets easier after the hump. When you feel a certain fluency when you’re coding apps, you know you’re over the hump. It’s a great feeling of ease, clarity and comfort. And it’s awesome! When you set your expectations of learning iOS development too high, you’re likely to give up when the going gets tough. You get frustrated, lose motivation and give up. When there’s too much time between learning sessions, you don’t build up momentum. Your brain doesn’t get enough exposure to the materials you’re trying to learn. So, you forget what you learn and you won’t get over the hump. If you give up before you start, you will never have to get over the hump. It sounds defeatist, and that’s the point: quitting before you start is exceptionally effective! You can try lots of things, decide that it’s not for you, and move on. Think about the time you’ve saved! If you commit to learning iOS development, then follow through. Don’t give up! Commit yourself, build momentum, and keep the pressure on. In essence, your ability to assess future failures makes you successful. You save time, money and energy because you didn’t waste it on something you were going to give up anyway. Instead, you spend these resources on something you’re 100% committed to. And that’s what you’ll succeed at. The place before the hump is known as The Dip. Seth Godin wrote a great book about it. And this is an excellent video that explains how The Dip works. The best way to learn iOS development is to start your own app project. You can try out newly learned things in your own app, and gradually build towards a complete app. The single biggest struggle for beginner app developers is transitioning from doing tutorials to coding your own app from scratch. Everything makes sense when you’re following a tutorial, but you’re stumped when starting a project from scratch. When you start your own project as early as possible in the learning process, you get used to coding from scratch. And that’s exactly what you want to practice. Don’t stay stuck with iOS tutorials! Divide your time equally between the three phases. You can move between the phases however you see fit, but you’ll see that it’s easiest to go from Learning to Practice to Experience. The last step is called the Experience Phase because real-world experience is important. If you stay in the learning and practicing phases, you never incorporate what you learn in real-world projects. It’s exactly this real-world experience that matters for employers, freelance clients, indie apps and startups. Building iOS apps is different in the real world, compared to the classroom. You might learn “fake” swimming on land first, but you don’t want to stay there forever. Jump in! The Practice Phase is crucial, too. I see iOS developers learn something new and then immediately apply it in a real-world project. This leads to errors and frustrations, because your new skill hasn’t developed enough to be ready for an actual project. Practice it from different perspectives first and avoid copying-and-pasting code. How do you start your app project? Building your own app project is incredibly fun and rewarding. It’s not just the end result that counts – the gradual progress of improving, learning and refining is what makes it worth it.